Tech Pkg V6 - Clean CARFAX - No accidents - Fully Serviced - QUALITY CERTIFIED up to 12 Months, 12,000 Miles WARRANTY CRYSTAL BLACK PEARL EBONY, LEATHER SEAT TRIM Leather Seats *Note - For third party subscriptions or services, please contact the dealer for more information. * You can tell this 2010 Acura TSX has been pampered by the fact that it has less than 77,872mi and appears with a showroom shine. Added comfort with contemporary style is the leather interior to heighten the quality and craftsmanship for the Acura TSX Let's be honest, not everyone wants to set a course blindly into the dark. For those of us that don't, there are vehicles like this with stellar navigation systems. This Acura TSX Tech Pkg V6 - Clean CARFAX - No accidents - Fully Serviced - QUALITY CERTIFIED up to 12 Month, 12,000 Miles WARRANTY is in great condition both inside and out. No abnormal wear and tear. If you're looking for world-class speed, acceleration, cornering and handling, don't blink because you'll miss this truly amazing automobile. 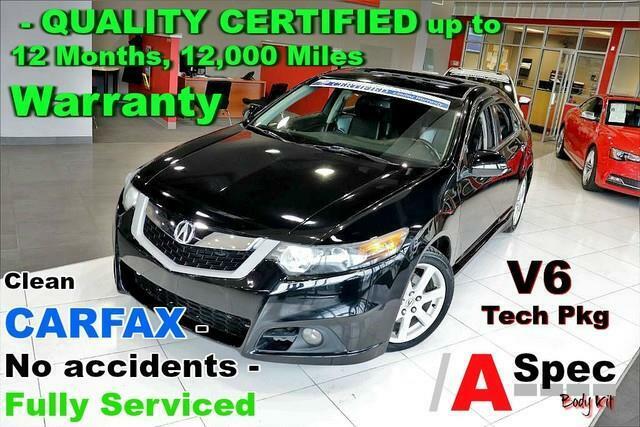 The Acura TSX Tech Pkg V6 - Clean CARFAX - No accidents - Fully Serviced - QUALITY CERTIFIED up to 12 Month, 12,000 Miles WARRANTY is in a class on its own. So much so, that Acura didn't miss a beat when they loaded this vehicle with an abundance of a-la-carte options. No matter the season or weather conditions, the tires on this Acura TSX can handle the job. This car has an exceptional paint finish that shows no sign of age or wear. This hard-to-find gem is an exquisite example of meticulous attention to detail and rich refinements. More information about the 2010 Acura TSX: While the TSX is considered Acura's entry-level sedan, it lacks in neither performance nor luxury. The TSX's base trim is very well-equipped. It offers a host of luxury and convenience items on all trims. The 2010 TSX holds its own against more expensive competition like the BMW 3-Series and Mercedes-Benz C-Class. This model sets itself apart with attractive and reliable, aggressive styling, and Superior handling and acceleration No Credit / Bad Credit / No Paystubs, No problem !! ! All Approved ! Everyone drives ! CLEAN, GORGEOUS, LOW MILES, SHOWROOM CONDITION. CALL NOW QUALITY CERTIFIED up to 10 YEARS 100,000 MILE WARRANTY , To Certify a vehicle, there will be an additional cost for Certification. CALL NOW For details. STUNNING AGGRESSIVE LOOK ON THIS BEAUTIFUL--Call today to schedule a test drive... Good Credit/Bad Credit/No problem!!!! Get paid cash? No problem!! 100% Credit Approval with interest rates starting at 2.49% for qualified customers, our rates will not be beaten. We price our cars at wholesale price to guarantee the best deals for our customers. Our inventory moves quick, please call to confirm the availability of the vehicle of your interest Springfield location 973-564-0112. This vehicle is located at our SPRINGFIELD location. Come visit our new showroom in Springfield NJ. Quality Auto Center is honored to present a wonderful example of pure vehicle design... this 2010 Acura TSX Tech Pkg only has 77,872mi on it and could potentially be the vehicle of your dreams! It's not a misprint. And the odometer isn't broken. This is a very low mileage Acura TSX. A rare find these days. This vehicle comes with a navigation system. That doesn't mean you won't get lost. But it does mean you won't stay lost. Marked by excellent quality and features with unmistakable refined leather interior that added value and class to the Acura TSX More information about the 2010 Acura TSX: While the TSX is considered Acura's entry-level sedan, it lacks in neither performance nor luxury. The TSX's base trim is very well-equipped. It offers a host of luxury and convenience items on all trims. The 2010 TSX holds its own against more expensive competition like the BMW 3-Series and Mercedes-Benz C-Class. Strengths of this model include attractive and reliable, aggressive styling, and Superior handling and acceleration No Credit / Bad Credit / No Paystubs, No problem !! ! All Approved ! Everyone drives ! CLEAN, GORGEOUS, LOW MILES, SHOWROOM CONDITION. CALL NOW QUALITY CERTIFIED up to 10 YEARS 100,000 MILE WARRANTY , To Certify a vehicle, there will be an additional cost for Certification. CALL NOW For details. STUNNING AGGRESSIVE LOOK ON THIS BEAUTIFUL--Call today to schedule a test drive... Good Credit/Bad Credit/No problem!!!! Get paid cash? No problem!! 100% Credit Approval with interest rates starting at 2.49% for qualified customers, our rates will not be beaten. We price our cars at wholesale price to guarantee the best deals for our customers. Our inventory moves quick, please call to confirm the availability of the vehicle of your interest Springfield location 973-564-0112. This vehicle is located at our SPRINGFIELD location. Come visit our new showroom in Springfield NJ.